Ukrainian film director Oleh Sentsov, who was convicted in Russia, has said that he is ending his hunger strike from October 6 because of the threat of force-feeding. "Due to the critical state of my health, as well as pathological changes in the internal organs that have now begun, the use of force-feeding is planned in the very near future. My opinion is no longer taken into account – I allegedly am no longer able to adequately assess the level of health and danger to it," Sentsov said in a statement distributed by his lawyer, Dmitry Dinze, on Friday. "Force-feeding will be carried out as part of reanimation measures to save the patient's life. In these conditions, I have to stop my hunger strike from tomorrow, that is from October 6, 2018," the statement says. 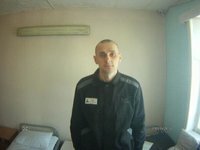 Sentsov believes that the goal of the hunger strike has not been achieved. He thanked those who supported him. "I am grateful to everyone involved, including our [FSIN] doctors, Labytnangi hospital physicians, and lawyers who encouraged him to live and told him that life goes on. Our doctors, specialists were the ones who persuaded him [to live] at the end of the day. He chose life," Maximenko told Interfax. FSIN's press service clarified that the convict had agreed in writing to eat.